The brake system is perhaps one of the most important components to your safety, apart from the steering system. The brakes must be checked and maintained constantly to ensure correct operation and efficiency. 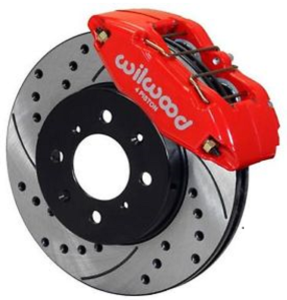 The brake system composes of a brake calliper (clamp) and a round disc rotor, hence the name disc brakes. When you push on the brake pedal (with your foot) fluid is pushed from the brake master cylinder (which is generally situated in the engine bay) down a metal tube down to a rubber line then to a brake caliper. 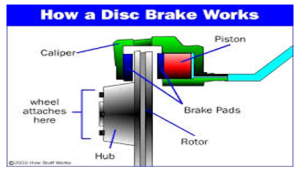 An internal piston is pushed on to brake pads which then clamp on either side of the disc rotor, consequently stopping the car. When a vehicle comes in for a service, the items we check are scored. Disc rotors, worn out brake pads, and moisture content in the brake fluid. Brake fluid is hydroscopic which means it tends to attract moisture – excess moisture in the brake fluid can cause catastrophic brake fade, resulting in poor braking performance and rapid deterioration of internal brake seals. This is why periodic services are critical! Because most brakes are now self-adjusting it is nearly impossible to detect the wear rate on your brakes until you hear the dreaded grind and that is a clear indication that brakes should have been replaced a long time ago. The problem when most people drive only one car is that they get use to the condition and the characteristic of the cars braking performance or poor performance and this is where it becomes dangerous. I have seen cases where customers got so use to the grinding noises that the brake pads have actually fallen out of the caliper, causing the caliper piston to pop out, resulting in loss of hydraulics and nearly complete loss of braking. Here at Manny’s Mechanical Repairs we offer and perform complete brake inspection, repair and machining. We constantly check brake condition and brake fluid moisture content in every service and we conduct complete brake repairs to cars and light trucks.